The recent economic crisis suffered by the Spanish construction sector has brought to light its excessive vulnerability to fluctuations in the real estate market. Overcoming this situation requires to innovate the sector in order to increase its efficiency. A large amount of researches in Spain focus on the improvement of the environmental efficiency of construction works, but only a few of them deal with its economic efficiency. The current study arises from the importance of the latter in order to achieve a comprehensive sustainability in construction. We introduce a process-based budget model, the POP model, whose most significant strength is the direct inclusion of all costs incurred at the building production site. In this way, process-based estimates expose with transparence and accuracy the real nature of the projected works, contributing to improve their economic management. In Economics, technical efficiency is defined as the ratio between obtained results to costs incurred (Farell, 1957). Thus, a production unit is said to be technically efficient if it obtains optimal results from certain specific initial costs or if it is capable of minimizing those costs in order to achieve a result specified beforehand. If the production is distributed in the market according to its demand, thereby reaching a maximum benefit, the distribution efficiency is considered optimal. Therefore, economical efficiency is defined as the product of technical efficiency by distribution efficiency. In Spain, the deep crisis impacting the construction sector since 2008 has evidenced its vulnerability to fluctuations in the real estate market, whose outcome is too little distribution efficiency and a deteriorated economic efficiency. Overcoming this situation requires the search of solutions that improve the sector’s competitiveness and strength, emphasizing those dealing with environmental optimization and energy efficiency (Pacheco, 2009; Aranda and Zabalza, 2010; León et al., 2010; Ruiz and Romero, 2011; Travenzan and Harmsen, 2013; Villoria et al., 2013; Cuchí et al., 2014; Villoria, 2014). The corresponding research on sustainability and economic efficiency matters is still under development, although concerning a few specific issues (Montes et al., 2011; García-Erviti et al., 2015) if compared at international level (Badea et al., 2010; Appleby, 2012; Carson and Abbot, 2012; Slaughter, 2013; Ibrahim et al., 2014). While focused on production costs, the present paper aims precisely at improving the economic efficiency of the construction sector in Spain, a country that has traditionally shown big deviations between the budgets of the works and their real costs (Bustos, 2014; Cordero, 2014). This lack of precision in the estimates is due to a lack of correspondence with the real productive model. The main detriment is suffered by constructors and promoters who have to bear the costs of the works without reliable preliminary data for making the necessary decisions. In order to resolve the problem, this research analyzes, improves and optimizes the so-called Process-based Budget Model (or POP model for Presupuestos de Obras por Proceso, in Spanish) (Montes, 2007). Supported by budgets based on productive processes, this model can simulate and adapt itself to the reality of each construction. Since it has already been successfully implemented in construction works of different typology (Torezano, 2011; Márquez, 2012; Mesa, 2012; Montes et al., 2012; Ponce, 2012; Vásquez, 2012; Villar, 2012; Montes et al., 2014), it is time to officially introduce it as a transparent, efficient and consistent alternative to improve the economic efficiency in building construction. The work’s structure is the following: As an alternative to the model of construction work units, Section 2 presents the POP model as an integral, open and accessible model, capable of standardizing the procedures and languages in construction budgetary matters. Section 3 and 4 show the hierarchical structure of processes and costs, respectively. Section 5 details the procedure required to make a process-based budget, using an optimized version of the model; and finally, Section 6 presents a case study. Based on data provided in the expected cost estimate for the execution of the works, there are two types of budgeting models, the pre-dimensioned models and the detailed models. The first ones give a quick and approximate estimate of the works’ costs in the preliminary stages of a building’s life cycle, while the second ones estimate the costs of each process in detail. The POP model belongs to the latter. In Spain, the most typical detailed model is the model of construction work units (Ramírez- de-Arellano, 1998). This work unit is defined as the "group of resources (materials, machinery or work force) that are necessary to build an indivisible unit, which is then incorporated to the construction site, and it also represents the smallest component of the construction budget". 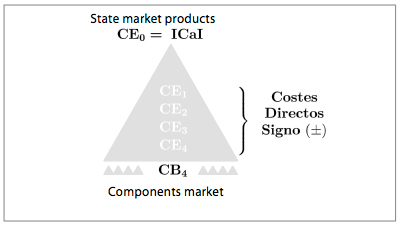 The corresponding cost structure generated at the building site distinguishes between Direct Execution Costs (CDE, in Spanish), which are integrated by applying the unit price to the quantity participating in the cost, and Indirect Execution Costs (CIE, in Spanish), which are incorporated by applying a relative value with respect to a reference value. Although this model has allowed an economic stability among different building actors, the crisis of the sector since 2008 has evidenced the need to rethink some of their fundamentals. 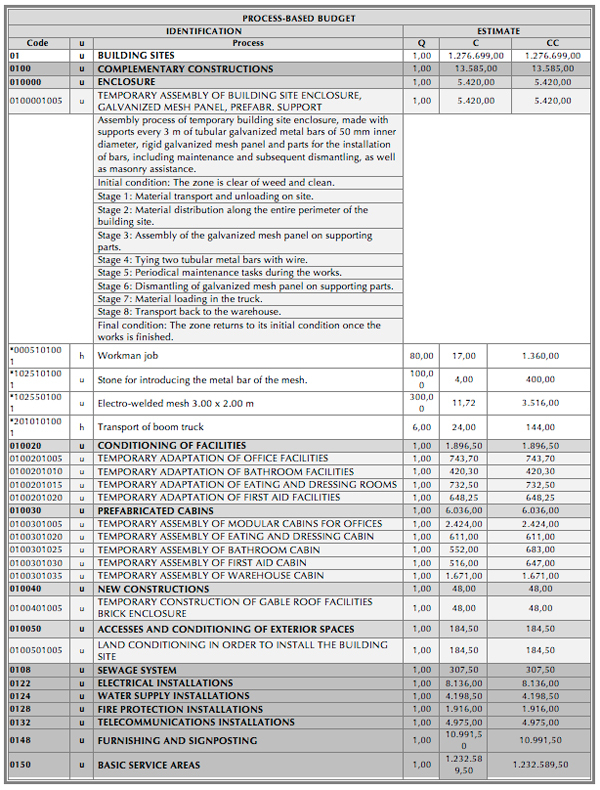 For example, while the CIE include most of the costs generated by the implementation, operation and dismantling of the building site, it turns out that such relevant costs as those derived from the foreman’s wage, cranes or temporary cabins or containers are diluted in the budget in the form of a percentage that does not properly represent how they were generated. They are not proportional costs depending on the volume of the works produced, but fixed costs. The lack of transparency in their estimation makes it difficult to modify them during the development of the works, which is especially problematic in rehabilitation works of existing buildings, where they can reach high percentages in relation to the CDE (Ramírez-de-Arellano, 2000). On the other hand, the processing of the CDE suffers from excessive homogenization derived from a generalized use of standardized cost-based pricing, which distorts what really happens in each construction work. Thus, it is considered, for example, that all square meters of a certain type of forging cost the same, when the truth is that the cost depends on the configuration of the voids in it, its environmental conditions, location, the means used for its execution and the efficiency of the work force, among others. In contrast to the previous model, it is possible to stand for an integral approach of the resulting building product as a single product (Carvajal, 1992). This is precisely the vision offered by the POP model, which considers the construction work as a single product resulting from a complex production system made of several production processes that are orderly interrelated according to the specific needs of each intervention. In order to understand its basic characteristics, it is helpful to include this model in the frame of methodologies that are being internationally developed in relation to building costs budgeting. In the first place, the ABC methodology (Activity-based Costing) identifies, classifies and organizes every action involved in the building site that has an influence on costs (Woo, 2001; Yuan, 2011). In this way, the construction companies have more control, transparency and balance in their cost accounting, since costs are managed at every moment considering a hierarchical level in which the corresponding associated process has been classified. Furthermore, the PBC methodology (Process-based Methodology) analyses the costs associated to every action involved in the construction in order to transform certain inputs (preexisting building, resources, waste and byproducts) in outputs or results (Gyoh, 1999; Pulaski, 2005: Nguyen, 2010). This allows connecting the budgets to the works’ planning. The POP model integrates these two methodologies in a natural way, thereby joining their advantages. The fact that both methodologies have not been extensively dealt with in Spain (Catalá and Yepes, 1999; Cavero et al, 2003) contributes with a novel factor to the model being addressed herein. One of the main strengths is that it does not distinguish between direct and indirect costs; all costs are charged directly in the budget. Although it can be applied to all kinds of works, its advantages are especially evident in rehabilitation works, where the building site costs are more elevated than the production costs themselves; and because a greater number of changes occur on site derived from new elements being discovered during the execution. Construction companies share the same approach when it comes to estimate their costs. Moreover, since companies present a great dispersion of unconnected models, the POP model appears as an open and accessible alternative, capable of standardizing the procedures, favoring the information exchange among different actors and works, and optimizing the training of the sector’s technical staff. The POP model consists of a custom-made estimate of the costs of each construction works, depending on the way they are generated on the building site, that is, based on their generative production processes, called execution processes (PE, in Spanish), and the components into which they are disaggregated, that is, the basic processes (PB, in Spanish). The budget effectiveness depends on the correct frontier delimitation among these processes. 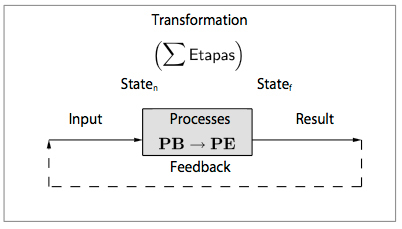 Specifically, the PE represent all the tasks that take place at the building site, which transform the input components into results (Figure 1). They are measured in units of process (u). On the other hand, the PB are formed by the input and output components, except for the building product itself. A distinction between exogenous and endogenous components is made. The former have their origin or destination outside of the building site, such as resources coming from supply markets, byproducts for secondary markets and waste, whose value or price has to be estimated in order to be incorporated to the works. These processes are measured in units of the International Metric System. In addition to the aforementioned standardized levels, process maps are disaggregated into a fourth additional level (PE4 and PB4), which has to be expressly defined by the budget estimator for every construction works. 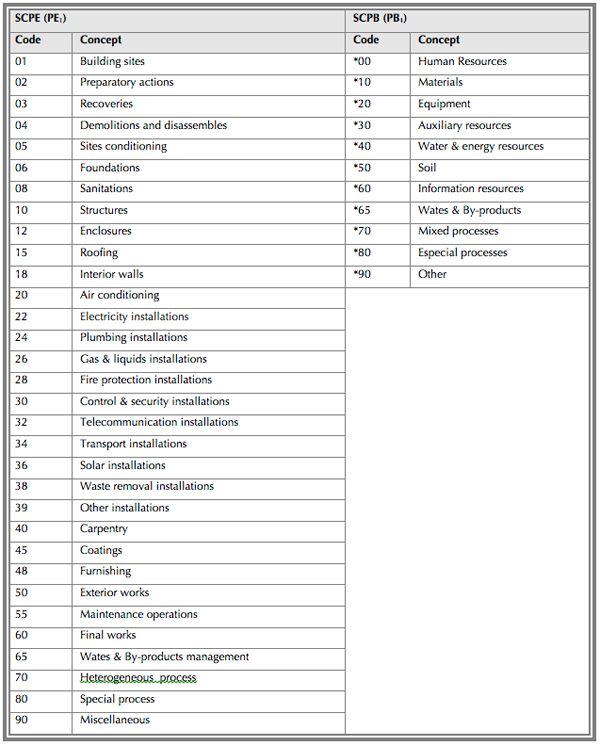 In the POP model, costs generated at the building sites are hierarchically classified in relation to their associated production processes (Figure 2). All of them are charged directly with their corresponding sign, where positive costs represent the expenses derived from the execution of the construction works, while negative ones represent the earnings of the constructor. The absence of indirect costs provides an accurate and transparent estimate according to reality, which facilitates the control of omissions and repetitions. Level 4 Basic Costs (CB4) corresponding to the PB4 are at the base of the structure. While representing the costs of the input or output components of the works, these costs are influenced by the characteristics of their markets of origin or destination, respectively, such as the prices and conditions of supply or waste removal. These costs are in turn incorporated to the costs corresponding to the lowest-level execution processes in which they take part: Level 4 Execution Costs (CE4). Although for the exogenous components this incorporation is direct (CB4→ CE4), when dealing with endogenous components, their basic costs are previously integrated to other CB4 before its final incorporation to their corresponding CE4 (CB4→CB4→ …→ CE4). See Table 2 for an example. 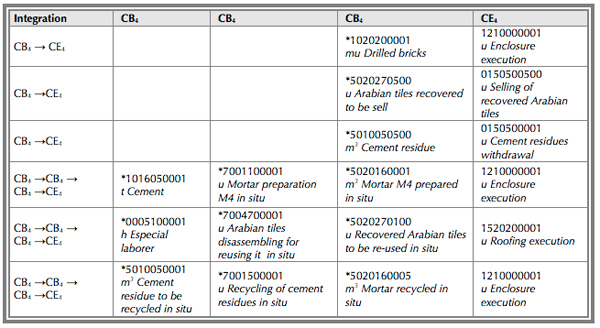 The remaining execution costs are obtained from the successive inclusion of the costs of the level immediately after, CE4→ CE3→ CE2→ CE1→ CE0, where the costs of level zero correspond to the total cost associated to the building production and are therefore equivalent to the Contract Price before Taxes (ICaI, in Spanish) of the building works, which is the objective of the budget. A process-based budget using the POP model starts with an integral analysis of the system. Some of the sources to be considered are project documentation, characteristics of the building site, prescriptions of the applying regulation, situation of the component markets, contractual provisions. The next step is to identify, define and codify all lowest-level execution processes PE4 based on the planning, organization and scheduling of the works. Next, the lowest-level basic processes PB4, which are necessary to implement each execution project, are analyzed and codified. In both cases, the corresponding codification allows defining which upper level processes enclosing this lower-level processes are. Afterwards, both process maps are merged, thereby configuring the process-based budget itself; the execution process map is incorporated to the first four levels of the map and the PE4 disaggregate into a fifth level of processes corresponding to the PB4. Thus, the process-based budget is broken down in five levels: PE1→ PE2→ PE33→ PE4→ PB4. Additionally, the budget is complemented by records that specify all lower-level processes. These records merge the traditional content of decomposed prices and the terms and conditions into a single document. The records also specify parameters such as the theoretical consumption of components, the losses, and the quantity of components needed once the losses have been considered. As for the PB4 records of endogenous components, they also include their breakdown in basic integral components. • The quantification operation (Equation 1) determines the quantity needed by the process Pn in the works and the corresponding unit cost . • The integration operation (Equation 2) allows obtaining the complex cost CC of the process , that is, the total cost of all the units. 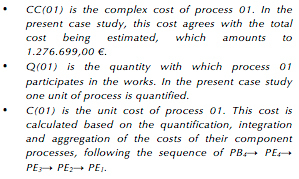 • The aggregation ascending operation (Equation 3) allows obtaining the unit costs of every process Pn-1 of level n1 by adding the complex costs of the set of its component processes of level n.
Thus, the process-based budget starts with the quantification of all basic processes PB4. The calculation of their cost (Equation 4) comes from the corresponding quantification, integration and aggregation of the set of basic components , and multiplication of the resulting value by a repercusion factor obtained as the inverse of the measurement of the basic process being analyzed in the measurement unit of its resulting component. Each calculation is detailed in the corresponding process record. The budget obtained is not just a static estimate of the costs expected from the execution of the designed works; it also enables a comparative analysis of their different planning, organization and scheduling alternatives, and the subsequent decision concerning the so-called optimal budget (Equation 5), that will allow getting the building product with the minimum total cost. In the light of the methodology proposed by Yin (1986), a closer look at the POP model is achieved through its application to a case study. Illustrated in Table 3, the case study is focused on the cost estimates expected from the building site of a real construction of 203 social housing, located on a site of 7,862 m2 in Sevilla (Spain). In order to estimate these costs, the first thing is to exhaustively analyze all the available information regarding the studied works (project documentation, awarding contract, among other sources), and the instruments that the construction company responsible for executing the works has. Following this analysis, planning of the actions needed to perform the assembly, maintenance and dismantling of the building site has to be done. This planning is crystallized in the identification and characterization of the execution processes of level 4 (PE4) that are specific to the works; for example, the process 0100001005 u Temporary assembly of the building site enclosure with prefabricated galvanized mesh perimeter fence with prefabricated metal bars. In the next stage, the budget is structured according to the processes by drawing the corresponding process map, where the identified PE4 are associated to their respective processes PE3, PE2 and PE1 of the Execution Process Classification System, the latter being process 01 u Building Sites. On the opposite side, the PE4 of the budget are disaggregated into its components, the so-called basic processes of level 4 (PB4), such as *0005101001 h Construction worker or *1025501001 u Electro-welded mesh 3.00x2.00 m. Since there are too many specifications, Table 3 only details the breakdown of some of these processes: the fully detailed analysis of this case study can be looked up in the Master’s Thesis of Juan Francisco Márquez Santana (2012). Once the budget has been structured by processes, the economic processing is made through the operations of quantification, integration and aggregation of its different component processes, starting from the lowest disaggregation level, the PB4, until ascending to the quantification and integration levels (Equation 6) of process 01 u Building Sites. It should be noted that, in the case study’s formal analysis of the process-based budget, the first three columns provide the qualitative information of the corresponding processes. Thus, the first column incorporates the codes associated to the SCPE and the SCPB, accordingly; the second column specifies the measurement unit and the third one, its denomination. On the other hand, the last three columns provide the quantitative information of each process: the quantity Q in its respective measurement unit, the unit cost C expressed in Euros/measurement unit and the complex cost CC in Euros, respectively. Finally, after the detailed analysis of the present case study, it is possible to establish that the economic data related to the assembly, maintenance and dismantling of the building site have been collected in the budget in a totally transparent way; thereby, the actors of the construction sector who participate in their execution are able to know and control them properly. Furthermore, it is confirmed that, unlike the cost homogenization of the traditional models, the POP model enables the drafting of custom-made budgets for each construction work, for the sake of maximizing the accuracy and reliability of their estimates, so that the different actors may adopt the best decisions in relation to each building works, based on the information provided. The present paper has introduced the Process-based Budget, or POP model, as an alternative tool aimed at improving the offer of existing budgeting models. The POP model allows making integral and personalized cost estimates, adjusted to the way it is really built, where all the costs associated to the building site, except taxes, are directly charged. With transparency and accuracy, the model makes the economic management of the construction works easier throughout their entire development; it allows identifying, at all times, the origin of the information and it evidences the potential cost omissions or repetitions so that they can be corrected. Likewise, its versatility offers the possibility of using it in the different stages of the building works, although the model information will be more reliable inasmuch as it is closer to reality, just like in the drafting of budgets in the execution stage prepared by the building actor for the follow-up and control. A future work may include the development of an integral model of construction works management based on production processes and the formulation of a transfer plan to the production network, which allows actors of the construction sector to rely on and implement the POP model, thereby contributing to actually increase the economic effectiveness of building construction throughout its life cycle. Profesor Contratado Doctor Interino. Departamento de Matemática Aplicada I. Universidad de Sevilla. Avenida Reina Mercedes, nº 4 A 41012 - Sevilla (Spain).